In its latest economic growth projections, Kennedy School's Center for International Development (CID) at Harvard University expects Pakistan's annual GDP growth to average 5.97% over the next 8 years, ranking it as the world's 6th fastest growing economy. Among Pakistan's other neighbors, China is forecast to grow at 4.41%, Sri Lanka at 3.77% and Bangladesh at 2.82%. 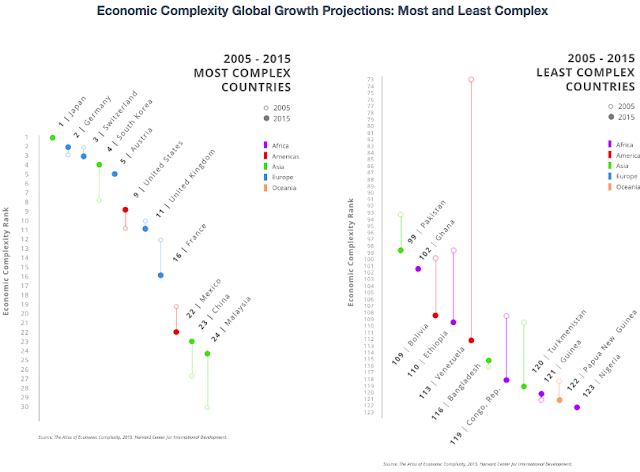 CID also released new country rankings of the 2015 Economic Complexity Index (ECI), the measure that forms the basis for much of the growth projections. 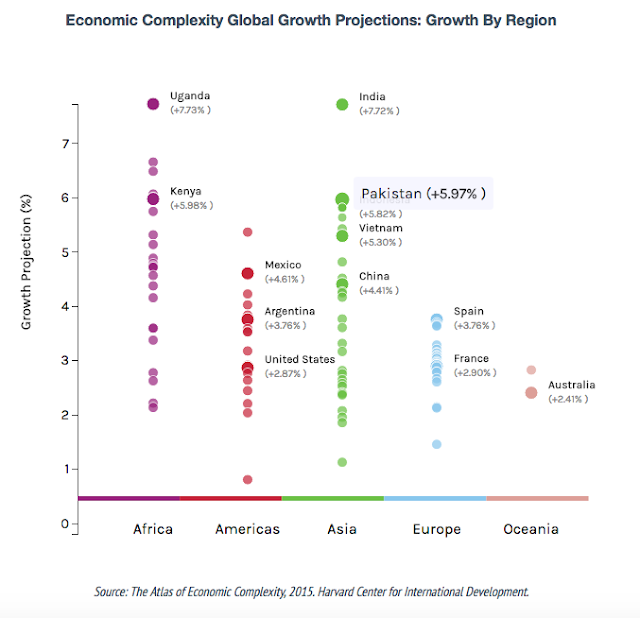 It ranks Pakistan at 99 for economic complexity. The complexity of an economy is related to the multiplicity of useful knowledge embedded in it, according to OECD. Because individuals are limited in what they know, the only way societies can expand their knowledge base is by facilitating the interaction of individuals in increasingly complex networks in order to make products. We can measure economic complexity by the mix of these products that countries are able to make. The countries that show the fastest declines in the complexity rankings in the decade ending in 2015 nearly all have had policy regimes that have been adversarial to the accumulation of productive knowhow, with the largest declines in Cuba (-50), Venezuela (-44), Zimbabwe (-23), Tajikistan (-22), Libya (-22), and Argentina (-18). Globally, the fastest risers in complexity in 2015 have been the Philippines, Malawi (+26 to 94th), Uganda (+24 to 77th), Vietnam (+24 to 64th), and Cambodia (+16 to 88th). The ECI finds the most complex countries in the world, as measured by the average complexity of their export basket, remain Japan, Switzerland, Germany, South Korea, and Austria. Of the 40 most complex countries, the biggest risers in the rankings for the decade ending in 2015 have been the Philippines (ECI rank: up 28 positions to rank 32nd globally), Thailand (+11 to 25th), China (+10 to 23rd), Lithuania (+9 to 30th), and South Korea (+8 to 4th). Conversely, the biggest losers have been Canada (-9 to 33rd), Serbia, Belarus, Spain (-6 to 29th), and France (-6 to 16th). Improved security situation and rising investments, particularly the China Pakistan Economic Corridor or CPEC-related investments led by China, are helping accelerate the economic growth in the country. It is the fear of CPEC's success that appears to be driving a growing campaign of fear, uncertainty and doubt (FUD) waged by Pakistan's detractors in South Asia region and around the world. There must be some mistake here, since they have got India growing much faster than Pakistan and China growing much slower than both. Ahmad: "There must be some mistake here, since they have got India growing much faster than Pakistan and China growing much slower than both." China’s Minister for Science and Technology Dr Wan Gang along with Federal Minister for Science and Technology Rana Tanveer Hussain on Saturday called on President Mamnoon Hussain at the Aiwan-e-Sadr. On the occasion, Dr Wan offered to cooperate in all sectors where Pakistan needed support including maritime industry, biodiversity, renewable energy, establishment of joint scientific labs for the young scientists and working together for the climate change for benefit of entire humanity. Speaking with the delegation, President Mamnoon said that the use of modern technology in the CPEC-related energy projects would alleviate the energy crisis in Pakistan and play a key role in it’s long-term growth. He said that the bilateral cooperation in the field of science and technology was progressing well. He hoped that the decisions taken during this visit would further enhance the cooperation in this important area. “We are also interested in benefitting from China’s ambitious China-South Asian Countries Science and Technology Partnership Programme (CSA-STEP) and enhance our economic cooperation through technology transfer,” he added. He noted that with satisfaction that 17 protocols had been concluded so far in accordance with the Framework Agreement on Science and Technology, signed between the two countries in 1976 and the 18th Protocol was being signed during this visit. He said that Pakistan and China were strategic partners and good neighbours. He said that the friendship with China was the cornerstone of their foreign policy and bilateral strategic partnership served as an anchor for regional peace and stability. He emphasised to maintain the momentum of high-level bilateral exchanges and enhance people-to-people interaction. He underscored that the China-Pakistan Economic Corridor (CPEC) was the latest example of their excellent economic cooperation. Scientific knowledge and technology could bring value addition to the CPEC projects, he said, adding they were keen to incorporate this knowledge in industry for value addition of local raw materials and finished products. The president said that Pakistan would continue to focus on further enhancing trade relations with China to bring them at par with bilateral political and strategic relations. Chinese Ambassador Sun Weidong and senior officials were also present in the meeting. Analysts said a poor demand in the economy and banks’ reluctance to lend to new projects had led to this decline. Fresh investments by the corporate sector in the financial year 2016-17 grew at the slowest pace since 1992, Business Standard reported on Saturday. In FY 2017, the combined capital expenditure by the country’s top 1,000 non-financial firms, in terms of revenue, was up by just 5.8% – the previous low of capital expenditure growth was recorded in 1999. Analysts said this decline was because of poor demand in the economy and banks’ reluctance to lend to new projects. Fresh investments, worth Rs 2.07 lakh crore, by the top 1,000 companies in the last fiscal was down from Rs 2.9 lakh crore in FY16 and an all-time high of Rs 5.7 lakh crore in FY14. The drought, led by domestic private companies, is in complete contrast to their past behavior, an analysis of a common sample of listed companies suggested. The capex growth registered by private sector companies is also the slowest in 12 years. The incremental capex by listed private companies was Rs 2.15 lakh crore in 2016. It nearly halved to around Rs 1.1 lakh crore in the last financial year. The amount is a third of a record high reached in 2012 and the lowest in 10 years. Riaz, what could be the reason for Bangladesh's economy to grow at 2.82%. Other sources, primarily Bangladeshi and Indian sources predict that it would be over 7% by next fiscal year and most Bengali's seems to be very happy about this. Even IMF and WB projected same growth for them. Anon: "what could be the reason for Bangladesh's economy to grow at 2.82%"
Harvard Kennedy CID projections are based on economic complexity on which Bangladesh ranks very low. Currently, Bangladesh economy is very one-dimensional relying mainly on low-cost garment manufacturing that is driven by low wages. There's very little diversification on the horizon. Bangladesh’s garment-making sector has rebounded so strongly following the Rana Plaza disaster that economists and labour leaders are warning it risks holding back the country’s economy as a whole. Nearly four years after the collapse of a factory in Dhaka, the country’s capital, in which more than 1,100 garment workers were killed, western clothing companies are buying more from Bangladeshi factories than ever before. But while the booming garment industry is contributing to an overall growth rate of 7 per cent, economists say it is suppressing wages and crowding out higher value sectors. 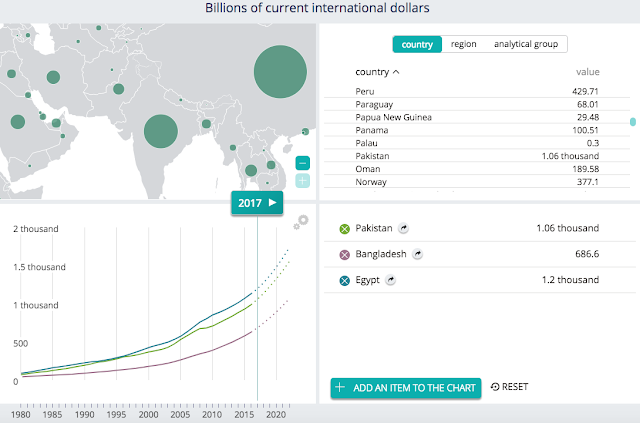 In the 1983-4 fiscal year, Bangladesh garment sales abroad made up 3.9 per cent of its total exports and were worth $31.6m, according to data from the Bangladesh Garment Manufacturers and Exporters Association. By 1989-1990 that had risen to 32 per cent, worth $624.2m. At the time of the Rana Plaza collapse — the country’s worst industrial disaster — garment exports had reached 80 per cent or $21.5bn. Despite the tragedy, the sector has continued to grow, hitting $28.1bn in the last financial year and accounting for 82 per cent of total exports. Industry representatives say the continued growth is the result of the unprecedented action it took in the aftermath of the disaster, agreeing to independent safety checks and including workers and unions on inspection teams. Moody's Investors Service has today affirmed Pakistan's B3 issuer and senior unsecured ratings, and maintained a stable outlook. Pakistan's medium-term growth outlook is strong, Moody's said, supported by the China-Pakistan Economic Corridor (Cpec) project" to address critical infrastructure constraints, and the continuing effects of macrostability-enhancing reforms started under the International Monetary Fund (IMF)'s Extended Fund Facility (EFF) program in 2013-16". However, the agency added that government's debt burden is high and fiscal deficits remain relatively wide, driven by a narrow revenue base that also restricts development spending. "In addition, foreign exchange reserve adequacy, albeit stronger than a few years ago, would still be vulnerable to any significant increase in imports. Domestic politics and geopolitical risk also continue to represent a significant constraint on the rating." Concurrently, Moody's has affirmed the B3 foreign currency senior unsecured ratings for The Second Pakistan International Sukuk Co and The Third Pakistan International Sukuk Co.
Moody's said the outlook for growth has strengthened as a result of increased macroeconomic stability due to reforms started during the three-year IMF extended fund facility programme and following the launch of the Cpec project in 2015. In the fiscal year ended June 2016, real GDP growth reached 4.5 per cent, up from 4.1 per cent in both 2015 and 2014, The agency said. Moody's expects such growth rates to be maintained or exceeded in the next few years. By contrast, the median rate of growth for B-rated sovereigns was just 2.7 per cent in 2016. Moody's said that from a macroeconomic stability perspective, the IMF programme succeeded in encouraging fiscal deficit reduction, more rigorous inflation management and the rebuilding of foreign exchange reserves. "While further progress will be challenging, as fiscal metrics remain weak and reserve adequacy is relatively fragile, our baseline assumption is that the steps that the authorities have taken in the last 3 to 4 years will not be reversed," it said. Moody's expects real GDP growth will rise towards 6 per cent over the next few years, as the economic benefits of the Cpec gradually materialise and past policy reforms continue to support economic potential. The Cpec will increase Pakistan's competitiveness and lift potential GDP growth by relieving supply-side constraints, particularly in power and transport infrastructure, and by catalyzing private sector investment, the agency said. "However, security related issues and a weak track record of public project implementation suggest the pace of project execution will be relatively slow," Moody's added. "Therefore, while the Cpec will support Pakistan's credit profile, Moody's expects the economic impact to materialise more slowly than the government envisions, resulting in real GDP growth closer to 5.5 per cent over the next two years, compared to government forecasts for 6 per cent growth in fiscal year 2018, rising to 7 per cent by 2020." How is India able to grow 2%+ per capita more than Pakistan? Is there a lesson in there for Pakistan? Annika: "Is there a lesson in there for Pakistan?" Pakistan needs investment of 28% of GDP to achieve 7% economic growth, a capital-to-output ratio (COR) of four. The big difference between the two countries has been the higher investment rate as %of GDP in India (34%) than in Pakistan (15%) .... a combination of higher domestic savings rate (28% in India vs 10% in Pakistan) and FDI. If Pakistan can increase investment to the same level as India's, there's no reason Pakistan economy can't grow at the same rate as India's or even faster. With China leading foreign investment via CPEC to boost infrastructure and energy availability, Pakistan has an opportunity to significantly increase overall investment rate by attracting investments from multiple foreign sources. 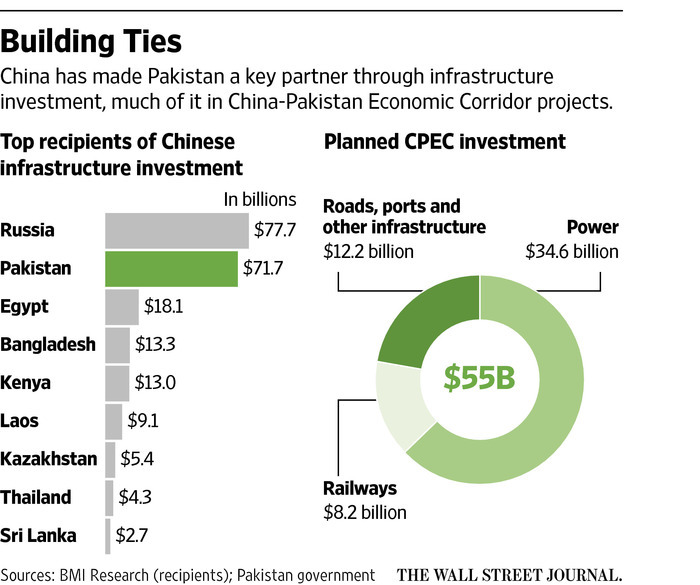 What will be the true effect of CPEC? Some like you say it will be very positive infrastructure help at subsidized investment and others claim it will increase debt because of 7% interest on $24 billion and benefit China more. Annika: "others claim it will increase debt because of 7% interest on $24 billion "
The Chinese soft loans for CPEC infrastructure projects carry an interest rate of just 1.6%, far lower than similar loans offered by the World Bank at rates of 3.8% or higher. The rest is investment by Chinese companies which are getting loans from China's ExIm Bank at concessional rates and from China Development Bank at commercial rates. These loans will be repaid by the Chinese companies from their income from these investments, not by Pakistani taxpayers. Pakistan's absolute public debt will increase but so will its GDP. Hopefully, the overall ratio of debt-to-gdp will decline from the current 60% to a significantly lower level. The Chairman Board of Investment (BoI) Dr Miftah Ismail has said that the federal government is planning to establish 46 Special Economic Zones (SEZs) along the mega project of China Pakistan Economic Corridor (CPEC) route in the long run. While addressing the concluding session of Pakistan China Industrial Cooperation dialogue in Islamabad on Thursday, he said that nine zones have already been declared prioritized during the 06th Joint Coordination Committee between Pakistan and China meeting held in December 2016. Miftah expressed the commitment of the Pakistani government to nominate a working group to deliberate on how to build the zone. He said that either Chinese or Pakistani companies can build the zone or the same can be built jointly by both sides. The Chairman BOI highlighted that products manufactured in these zones can not only to be exported but these can also be sold in the local Pakistani market, where they are not required to pay any customs duty. He said that this makes the zone ideal for investors as Pakistan has a big market of 200 million plus people. Miftah Ismail said that the model can be primarily export oriented but in case of China import substitution also has a lot of potential, adding that the Government has already given its commitment to provide all utilities and security to the investors in these zones. The Chairman Board of Investment pointed out that each zone has its special features for investors in terms of its location, raw material, skilled work force and linkages with other parts of the country and outside the country. Miftah Ismail said that China has rich experience in developing zones particularly from 1985 to 1995 and from 2009 till 2015 and Pakistan can learn much from Chinese experience. General Qamar Javed Bajwa reiterated on Wednesday the determination of the army and other law enforcement agencies to provide fool-proof security to the China-Pakistan Economic Corridor (CPEC) calling the multibillion-dollar project ‘harbinger of peace and prosperity’ in the region. “While the army will provide security to the project [CPEC], the other national institutions will have to come forward and play their respective roles,” he said while speaking at a function in Islamabad on CPEC Logistics on Wednesday. “We as a nation can only benefit from this historic opportunity, if we prepare ourselves to embrace it. All national institutions will have to make a deliberate effort to ensure success of CPEC,” he added. CPEC is truly a harbinger of economic development, peace and prosperity in the region, he said, adding that unlike some other countries of South Asia, Pakistan believes in focusing its energies on peace and inclusiveness, rather than divisive competition. He was apparently referring to India which publicly opposes the multibillion-dollar project. “CPEC would bring increasing economic integration among regional economies and reduce the development gap within various regions of Pakistan,” he said. Gen Qamar said the Chinese investment in various fields, including energy, infrastructure, Gwadar port and special economic zones, can lay the foundation of a fast-developing Pakistan if the opportunity was optimally utilised. “We take immense pride in our relationship with China that has always remained on an ascending trajectory and now encompasses almost every sphere of our life. The lasting imprint of this brotherly partnership is visible in state-to-state, military-to-military, business-to-business and people-to-people contacts,” he said. The army chief went on to say that the Sino-Pak relationship is based on the principles of peaceful co-existence, commonality of interest and shared perception on regional and global issues. “We have always stood by each other through thick and thin and at every critical juncture of our history. That is why we are called Iron brothers. “Xi Jinping’s grand vision of One Belt, One Road (OBOR) has opened up a whole new world of opportunities for the countries of the region and beyond. CPEC, being an important project of OBOR, holds great promise for turning around the economies of Pakistan, Western China and the region,” he added. The army chief said to reap benefits from CPEC Pakistan needs education, training and skill development of the youth. “We also need to improve our existing laws and regulations to provide a facilitating framework for trade and investment activities. We need infrastructure and urban planning to ensure that we are able to handle large volume of business and transport, without any hassle,” he added. Commenting on the prevailing security situation in Pakistan, Gen Qamar said the “country is much safer today than before as peace has been restored in Fata and the adjoining areas”. He said normalcy was also returning to Karachi. “Similarly, the law and order situation has improved significantly in Balochistan and there is great focus on socio-economic development in the province,” he added. “Pakistan is a resilient nation of over 200 million people, with a large ratio of vibrant, capable and enthusiastic youth. We need to capitalize on this opportunity to make Pakistan an economic power in coming years,” he added. He encouraged entrepreneurs to join hands with Chinese investors and make this dream a reality. “My dream is that by the year 2030, when we complete the current phase of economic partnership between the two countries, Pakistan should at least be in league with middle income countries,” he stated. All countries are resilient - it is human nature to survive. Just look at WW1 and WW2 and many natural disasters. The choices you make and the decisions you take determines the degree of your progress and prosperity. Pakistan exported surgical goods and medical instruments worth US$ 339.19 million during the last fiscal year ended on June 30, 2017, as against the exports of US $ 358.766 million of the corresponding period of last year. The exports of above mention goods were recorded at US$ 358.766 million during the financial year 2015-16. According to the data of Pakistan Bureau of Statistics, the cutlery exports grew by 2.52 percent and reached at US$ 82.436 million in the fiscal year 2016-17 as compared to the exports of US$ 80.404 million in the same period last year. Meanwhile, the exports of chemical and pharma products increased by 9.21 percent as chemical and pharmaceutical products valuing US $ 878.463 million exported as compared the exports of US $ 804.337 million in the same period last year. During the period from July-June, 2016-17, about 44,250 metric tons of fertilizers manufactured valuing US$ 10.158 million exported as compared the exports of the same period last year. During the last financial year ended on June 30, 2017, exports of fertilizers manufactured grew by 100 percent as compared the corresponding period of last year, the data added. According to the data, about 9,029 metric tons of pharmaceutical products worth US$ 212.291 million exported which was up by 3.63 percent against the exports of last year. The country had earned US$ 204.846 million by exporting about 11,112 metric tons of pharmaceutical products during the year 2015-16, it added. ISLAMABAD, Pakistan: The exports from the Country, on year-on-year basis, increased by 16.16 percent during June 2017 as compared to the exports of the same month of last fiscal year. The exports from the country were recorded at $1.912 billion during June 2017 as compared to the exports of $1.646 billion during June 2016, showing positive growth of 16.16 percent, according to the latest data of Pakistan Bureau of Statistics (PBS) on Wednesday. The imports during the month also grew 2.16 percent by going up from $4.438 billion during June 2016 to $4.534 billion during June 2017. Based on the figures, the trade deficit on year-on-year basis was recorded at $2.622 billion in June 2017 as compared to the deficit of $2.792 during June 2016, showing negative growth of 6.09 percent. On month-on-month basis, the exports from the country during June 2017 increased by 17.52 percent when compared to the exports of $1.627 billion in May 2017. The imports into the country decreased by 10.96 percent in June 2017 when compare to the imports of $5.092 billion in May 2017. The overall trade deficit during the fiscal year 2016-17 widened by 36.32 percent as compared to the deficit of last fiscal year, as imports into the country dipped by 18.67 percent while exports witnessing negative growth of 1.63 percent. During the period under review, the imports from the country were recorded at $53.026 billion as compared to the imports of $44.685 billion during 2015-16, showing growth of 18.67 percent. On the other hand, the exports from the country decreased by 1.63 percent by falling from the $20.787 billion last year to $20.448 billion during 2016-17, the data revealed. Pakistan is the world’s fourth fastest growing economy after Bangladesh, Ethiopia and India, according to the 2018 global research report by HSBC. Titled ‘The World in 2030‘, and released on 25 September 2018, it gives HSBC’s long-term projections for 75 countries. According to HSBC, China looks set to be the world’s largest economy by 2030 while India would jump to No. 3 after USA, pushing Germany and Japan down. Pakistan’s GDP growth projections to 2030 will average 5.7%, the highest being 6.5% in 2028-2033 five-year period.